This giveaway is now closed. Thanks for stopping by! Congrats to Paula H, Amber and Bridget C! Sunny Days…Ok…so I’ve been singing this with my little boy the past few days (giggle!). I grew up watching Sesame Street. In fact, my mother tells me that at the time, it’s really the only television show she’d let me watch. My son loves watching the show and his favorite character is Elmo. My mother-in-law gave my son my husband’s stuffed Elmo from when he was a child. 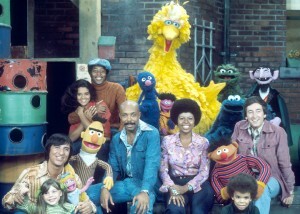 My point is, Sesame Street has been around a long time (40 years to be exact) and a lot of history has been made. It’s interesting to watch the same show we watched as children with my son. For 40 years, sunny days have swept the clouds away and inspired preschoolers to learn, grow and achieve their highest potential. 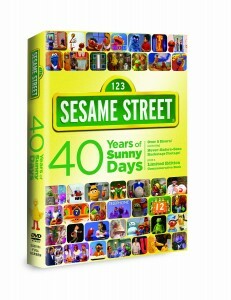 Relive the best-of-the-best when SESAME STREET: 40 YEARS OF SUNNY DAYS debuts as a two-disc DVD set November 10 from Vivendi Entertainment and Sesame Workshop, the non-profit educational organization behind Sesame Street. Premiering on November 10, 1969, Sesame Street is the longest running children’s series and “…arguably, the most important children’s program in the history of television” (Newsweek.com). Featuring nearly six hours of everyone’s favorite Sesame Street stories, songs, Muppets™ and celebrity segments, the SESAME STREET: 40 YEARS OF SUNNY DAYS collectible set spans the renowned show’s four decades, includes never-before-seen archival footage and a limited-edition hard covered commemorative book. I am so excited about seeing this. I have no idea if I’ll remember any of the episodes but it’s going to be fun reliving those memories. 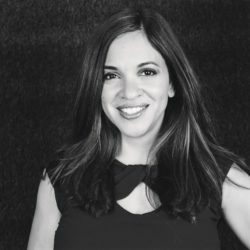 Tomorrow is the release (did you happen to see Google yesterday and today?) and the two-disc set will be available for $29.93. Win It! Two of you will win a copy of this DVD and one of you will win a copy of the DVD PLUS a copy of Sesame Street: A Celebration – 40 Years Of Life On The Street. Simply leave me a comment with your favorite Sesame Street moment. Comments will close on November 20, 2009 at 10 PM PST. One comment per person, please (unless you do the extra credit). US residents only. Duplicates and comments not including the above information will be disqualified. Comments are moderated. If you don’t see your comment in a reasonable amount of time, send me an email. 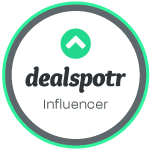 Bloggers and non-bloggers may enter. If you don’t want to leave your email address, please be sure to check back for my announcement on the winner. Please note that winners must respond within 48 hours of being announced/contacted or another winner will be drawn. Want an extra entry? Do any or all of the following and receive an extra entry for each one. My favorite Sesame street moment is when Cookie monster is saying his ABCs and says ABC chocolate chips cookie. The little girl that he is talking to is so cute and she giggles throughout the skit. I can’t think of one favorite moment, but I also liked when they had the little “yippers” on…. yip, yip, yip, uh-huh, uh-huh! My favorite moment was a recent one. Mike Rowe (from Dirty Jobs) was in Oscar’s trash can. I love that both adults and kids can enjoy the show on different levels! main entry: I guess my favorite SS moment was watching my 5yr old grandson grow up with Ernie since he was just a baby. He loves Ernie still and has about 8 ernie dolls some are vintage we collected for him. He loves seeing ernie at all espeacailly when it shows ernies feet and legs which is seldom but when it does he just laughs he loves the way Ernie is always bugging Bert. great giveaway thanks! My favorite Sesame Street moment was when everyone was finally able to see Snuffy. He was such a great character for only Big Bird to be interacting with. Thanks for the opportunity. After that would have to be anything with Grover. Hard to figure out a favorite moment, so I’ll pick one of my kids favorite – Mr. Noodle getting dressed! I subsribe to your feed via email. many, many years ago, on sesame street, ernie made a clay sculpture of bert, and ended up running out of clay, so the sculpture didn’t have a nose…so he pulled off bert’s nose, and put it on the sculpture! My favorite Sesame Street moment is always watching the show with my daughter. She loves it. Another funny moment was when she got the Hokey Pokey Elmo; loved it! Whenever Ernie sings about his love for his rubber duckies in the bathtub with his special rubber ducky song. Stuck with me forever! I want this set SO bad! My favorite SS moment is the kid going to the store…A Gallon of milk, a Loaf of bread, and a stick of butter….I still say that every time I go grocery shopping! LOL! One of my favorite Sesame Street moments is when the Orange sang Carmen:) http://www.youtube.com/watch?v=jG-0_p_yefg&feature=related What a classic moment and so clever! I love how Sesame Street has always strived to introduce children to all sorts of cultural things around them… like opera. I have always enjoyed Sesame Street since watching it with my son every morning. My favorite was always Oscar because he said what he meant. My favorite Sesame Street moment is kind of silly. I loved the episode where Ernie tries to remember something so he ties a string to his finger and to remember that he ties a string to his other finger etc. etc. and in the end forgets what he was suppose to remember. Yes I did watch these wonderful shows with my kids. Thank you! I always loved Ernie singing his rubber ducky song and just down right irritating Bert! I follow and I tweeted! Whenever Cookie Monster appears is my favorite moment! Hi! I adore Sesame Street and have written several Sesame Workshop books. My all-time favorite Sesame skit was the “telephone rock.” Anybody remember that? “Rock, rock, rock…the telephone rock!” The Muppets sang this while everyone was tring to cram into the phone booth. I guess my second-favorite would be the “yip-yips” looking at the ringing telephone and saying (of course) “Yip, yip, yip, yip…” Ernie singing to Rubber Duckie in the tub is a classic, too. Who could ever forget: Luis and Maria’s wedding, Big Bird trying to understand the death of Mr. Hooper, or Andrea Boccelli singing “Time to Say Goodnight” to Little Elmo as he’s going to sleep! I’m sure you can tell that I would SO love to win this! I always liked when Mr. Snuffalufagus would come around. Well Sesame Street started just a few months after I was born, so I always tell my two boys that mommy is the same age as Sesame Street. I loved the way they handled things when Mr. Hooper died. I can still sing many of the songs. I even owned a record when I was little that had the song “Sing, Sing A Song” Winning this would be wonderful. I remember the controversy over Snufflelupagus finally being seen by someone besides Big Bird. I was always a huge fan of anything they did with music, like Cookie Monster’s “Healthy Foods” rap a la Run DMC, Kermit’s moon song with and without Aaron Neville, and many many others. My favorite moment is when Snuffy came onto the street, and no one believed Big Bird that Snuffy existed… but he did! Who doesn’t love Sesame Street? 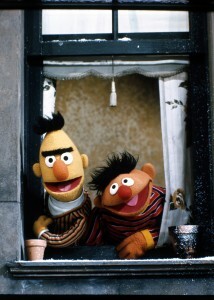 My early favorites were the ones with Bert and Ernie and how different they were but still good friends. My favorite moments are the most recent ones as I’ve seen my kids enjoy and learn with the show. One of their favorite christmas movies is Elmo Saves Christmas. I hope their kids and grandkids get to grow up with the show. My favorite moments were anything involving Grover as a waiter. I love Count Dracula. My favorite. hard to pick a favorite, probab;y the count is my favorite segment anyways. We love “C” is for Cookie by the Cookie Monster. I always loved any time where snuffulufagus showed up! I just loved it when the Count would sing!!!!!! I also grew up watching it. My adult daughters watched it when they were little. Now my 3yo daughter and 3yo granddaughter watch it too. My favorite was when they were singing the songs ABC, Baa Baa Black Sheep, Twinkle Twinkle which all have the same melody and they were doing them all together…it was very funny! 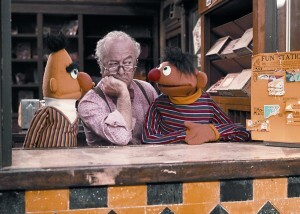 The best moment was dealing withe the death of Mr. Hooper, the store owner. Great stuff! I love everything involving that adorable worm! mother saw and grandchild,I like the togetherness. I love C is for Cookie song. I don’t really have a favorite moment, but I love anything with Elmo and Bert and Ernie. They are my favorite. Thanks! My favorite Sesame Street moments are Big Bird’s alphabet song and the C is for Cookie song. My favorite snippet between the show is the Two Dolls skit. My fav moment of watching Sesame Street would have to be the first time my daughter actually enjoyed watching it & asked for Elmo! She had a unique way of saying his name. It felt so GREAT because he is my fav character too! I always enjoyed the conversations of Ernie and Bert. So funny! My favorite is when Ernie has a cookie and Cookie Monster wants it. Ernie is happy and Cookie Monster is sad. They give each other the cookie, and switch between happy and sad. Then they try to share the cookie and drop it. Then they both start crying. I loved the “Rubber Ducky” song. I love the cookie monster talking about the letter g cookie! Wow I would love to win this! I remember SO many of the clips they showed back in the 80s. One I especially liked was the video that showed the process of making crayons! I love Ernie singing the Rubber Ducky song! Ernie with his rubber ducky. Thanks for the chance. There are too many for just one lol!! We just love Elmo, & my whole fam says I do the perfect Elmo imitation “Gotta love me! !” Have the cutest pic of my now 12 yr old dressed as Elmo for Halloween when he was 2….time sure flies..ah…. I always loved when Super Grover was on! I grew up watching Sesame Street and my favorite character was Oscar-is that some sort of reflection on who I am now? I hope not! My son loves Elmo and Cookie Monster, I’m hoping to find a Cookie Monster cake mold like the one my mom used for my birthday cake. Thanks! I love when they have stars on the show because it makes it fun for kids and adults alike to watch and enjoy. I love when they have stars on the show because it makes it fun for kids and adults alike to watch and enjoy! How neat!!! I remember how excited I was when I was little when we finally got cable! I could watch Sesame Street all the time!!! Put it up on my Facebook! My favorite moment is when Grover plays the horrible waiter to that blue bald puppet. I was always a fan of Mr. Snuffaluffagus’s area on Sesame Street. I love bert and ernie singing dance myself to sleep! I can’t remember a specific skit but I always looked The Count. I also loved Oscar the Grouch and his pet worm Slimey. My favorite Sesame Street moment is when I unwrapped a Stuffed Snuffaluffagus plush when I was a youngster. I loved that doll so much. His big eyelashed batted. I miss my Snuffy. I subscribe to the Rss Feed through Google Reader. I love the grumpy old guys sitting in the balcony of the theater, always making snarky comments!! i always loved cookie monster. i can relate! Hard to pick a favorite moment. 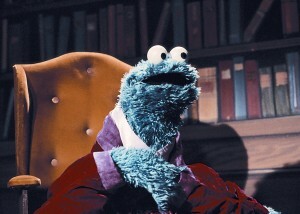 I love when Cookie Monster does Monsterpiece Theater, a play on Masterpiece Theater. I always loved when Kermit sang “It ain’t Easy Being Green”. My favorite moment was when Snuffy was discovered to be real by more than just his best friend Big Bird. Oscar and Mike Rowe in a trash can…my oh my…didn’t expect that! We use to love when Grover became Super Grover. Please accept my entry. Thank you. One of my favorite skits is Ernie sitting in a boat, yelling “Heeeeeere fishy, fishy, fishy” The fish jump right in the boat. Bert calls and a shark jumps in. So funny. I was lucky to be an intern on Sesame Street. When I met Big Bird, I almost fainted. Best show in the history of television. I love any moment with snuffeluohogas – bad spelling!!! I really enjoyed Jack Black disguised as a chicken. My favorite Sesame Street moment was when Bert and Ernie were in a boat fishing and Ernie kept calling, “Here Fishy Fishy Fishy!”. It used to crack me up as a child! I love anything involving the yip yips or the twiddlebugs but i think my #1 favorite sesame street moment was when bert and ernie had to give bert’s nephew brad a bath.. that little guy was so funny! I love being able to snuggle up with my almost two year old and watch Sesame Street. Everytime we do that is a great memory! I love when celebrities come on the sing the ABC’s. There are so many things I loved. I don’t remember one specific moment, but I loved beeker, snuffaluffagus, and the old men in the theatre. Thanks! I remember Bert showing off his bottle cap collection. I was so inspired as a child I started my own bottle cap collection. Great to know Sesame Street is still around for a new generation of children to enjoy. Thank you for the chance t win. The scene that sticks with me after all these years is when Ernie tries to tell Bert that aliens are in the bedroom — Bert doesn’t believe him. Those little “yep yep” aliens were a bit freaky — still are! My favorite Sesame street moment is when we got to to go see Sesame Street live! Ernie poking Bert with his finger! “Poke, poke, poke”! And we subscribed to your feed! I love any scene with Snuffeluffagus! And I probably totally mis-spelled that. 🙂 Thanks for the giveaway! I was always partial to the count. In fact, I made it for my daughter’s first birthday. My favorite Sesame Street moment is the C is for Cookie song! I loved that as a kid. I always loved it when the Count would…well…count! It made counting so exciting! I liked it when Ernie would sing the rubber ducky song. I love counting with the Count. the cookie monster! I love cookies 2! I will always love when Grover demonstrates near vs far. I don’t know why it’s so funny, but it always is. I love the Rubber Ducky song, thanks! I remember the first time I saw The Ladybug’s Picnic on Sesame Street and it just stuck with me. I loved it. I still think of it every once in a while for some reason and in fact was just singing it yesterday! I grew up watching Sesame Street..it helped me learn English when I came to the US when I was little =) I loved seeing Slimey the Worm with Oscar the Grouch, he’s the only one who Oscar likes! I used to watch it 3 times a day when I was a kid. I think I liked Oscar the grouch the best…but I always laughed at Big Bird when he would go see Mr. Hooper too. I’d like to win this for my nieces. They are 4 and 6. I’ve been showing them the Muppet movies. I need to get them hooked on Sesame Street too!!! The rubber ducky song! Such a great TV moment! I loved Sesame Street when I was younger! I always liked when Grover was on, especially when he was the waiter! I liked Rita Moreno’s guest spot. I liked when grover would talk to the audience. I loved when james taylor appeared on the show! My favorite Sesame Street moment was when they would do the Hokey Pokey dance! Each time they did it, I sprang to my feet and did it with them! Brings back great memories! Thanks! I always liked Bert singing “The Pigeon”, and a song called “Lady Bugs’ Picnic” I still sing them to my kids! I don’t want to live on the moon with Ernie and Aaron Neville would pobably be my favorite! I still know the words of “My name is David” from Sesame Street. I guess I’m pretty old because I remember when Sesame Street first started. I used to watch it every day before I had to leave for kindergarten. It’s how I started my mornings. I love Ernie singing Rubber Ducky! My favorite Sesame street moment is when Cookie monster is saying his ABCs and says ABC chocolate chips cookie. My favorite Sesame Street moment was when they went inside Snuffys home. SO COOL! I was like 6, so the memory isn’t clear. I just remember loving it. My favorite Sesame Street moment was when the rest of the characters got to meet Mr. Snuffleupagus.